Smith and Will discover a strange box which has the power to materialize any object the holder has in mind. Immediately there is great competition amongst the whole family for its services. But instead of being a blessing, it only makes the users progressively more greedy. Quarrels break out as to whose turn is next and even cheating is resorted to, while necessary chores are left undone waiting for the box to do them instead. Robinson, anxious at this change in his family, orders Smith to take the box back to where he found it. Smith is secretly determined to keep it but an Alien creature appears and silently demands what is evidently his property. 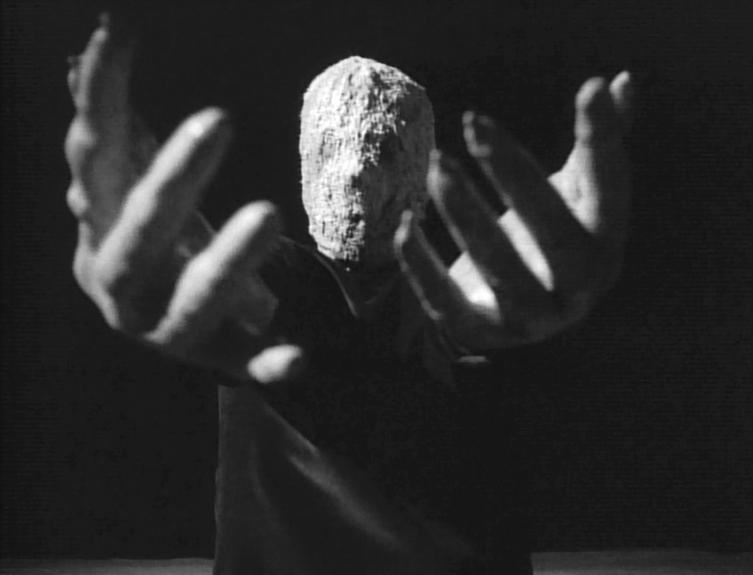 “Wish Upon a Star” has it all – Smith being evicted and having to survive creatures of the night; the discovery of a haunted relic of an alien spaceship; the wonderment of a wish machine; a monster whose featureless plasticized face, elongated dagger-sharp fingers, eerie mummy-walk, and mournful moan cause sufficient chills; and a moral. As with “The Sky Is Falling,” this one actually has a theme. “Wish Upon a Star” was a 1965 television equivalent to an Aesop’s Fable. The big payoff is when Smith asks for the one thing he should not have wished for – a slave. There are many smaller messages woven throughout the hour. John, the king Solomon in this story, is a symbol of wisdom. He says he is a pragmatic man and does not believe that you can get something from nothing – or, at least, something of true and lasting value. His lecture to Penny about lying and cheating is effective, as is her reaction to disappointing her father and coming to terms with how low she had sunk in his eyes. Will grows up a bit in this episode – and is rewarded in the end with one last apple. Smith does not grow. He is just happy to have survived. “It didn’t harm me!” he rejoices after returning the wish machine to the alien. In a future episode, Maureen will lament: “Poor Dr. Smith. He just doesn’t understand what moral integrity is.” And this is the moment in Lost in Space when Will, the lonely boy who has been in search of a friend, learns that he has someone who is the equivalent to a ten-year-old already in his company – Dr. Smith. The bonding between these two characters happens here. As a counterpoint to all the positive themes, there is the shadowy, cinematic, black-and-white photography. The series may have never looked darker … and better. 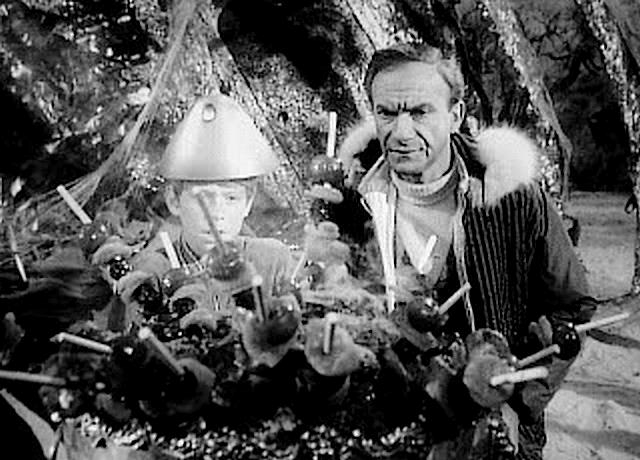 When Lost in Space used its position as a prime time network TV series with roughly 20 million people tuning in each week, and bothered to make a statement, it was a true treasure. Barney Slater’s story treatment, plus 1st and 2nd draft teleplays: September/October 1965. Reformatted Mimeo Department Shooting Final teleplay: October 22, 1965. Page revisions by Tony Wilson (on blue paper): October26. Additional page revisions by Wilson (on pink paper): October 27. Further revisions by Wilson (on green paper): October 29. Further revisions by Wilson (on yellow paper): November 2. “Wish Upon a Star” was Barney Slater’s first assignment for Lost in Space. Story development began while Buck Houghton was still producing. By the time Slater delivered his second and final draft of the script, Houghton was gone. Tony Wilson and Irwin Allen were so pleased with Slater’s work that they immediately asked him to take over the writing of “The Sky Is Falling,” replacing Herman Groves. That episode was filmed and aired first, but it only came to fruition as a result of Slater’s excellent work here. Page 35: Robinson should not ask Will if he has any ideas about the machine. This makes Robinson and Don look stupid. Will can, however, volunteer his ideas. Page 35 thru Page 48, all of Act II, is mostly talk. It is good dialogue but could bog down unless the pace is kept up. Could some action or excitement be inserted? Page 56: Everyone seems to take their first sight of the Rubberoid for granted. Shouldn’t all present comment on this unusual creature’s presence. Page 61: Why not have Robinson, Don and Smith continue on to the site of the old space ship. Robinson and Don have never seen it and it would be logical for them to go there, led by the reluctant Smith, to return the box. Page 62: The Fourth Act should end as soon as the Rubberoid receives the box from Smith and the electrical current crackles between the two antennae. Make it a nervous fourth act curtain! All of these changes came about as a result of Allen’s notes and Wilson’s script polishing. Wilson’s script was the first version sent to CBS. Per our discussion with Mr. Wilson, we understand the closing portion of the TAG sequence (where it appears WILL might be run over by the Chariot) will not be used, and that new script pages covering the end of the TAG sequence will be submitted. For the Teaser, which also set up and then resolved the cliffhanger from the previous episode, Will was removed from danger per the network’s request, and the rolling Chariot was taken out and replaced with Don risking his life to toss away the leaking fuel pack. “Wish Upon a Star” was assigned the production number 8512, yet it was shot before “The Raft,” which carried the production number of 8511. “Wish Upon a Star” was merely ready to begin filming sooner, while “The Raft” was held up with rewrites and preproduction. This was quite high praise coming from Roley since one of the other episodes he would direct was “The Anti-Matter Man,” considered by many fans, as well as the cast members, as being the best episode of the third season. Filmed October 27 – November 4, 1965 (7 days). Above: Utilized for this shot, one of the Jupiter 2 models used in the filming of photographic effects as the ship flies through space. Below: Sutton Roley had a knack for staying on schedule by posing cast members as he did in this shot, saving time by not requiring additional “coverage,” such as close ups on each of the players. 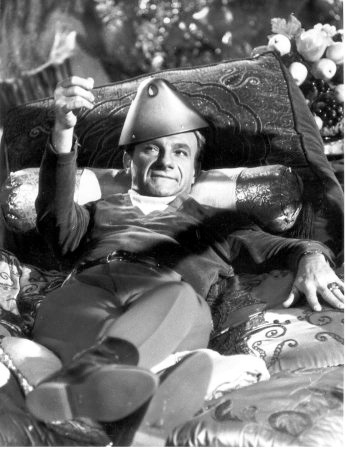 Above: Dawson Palmer as the “Rubberoid,” so frightening to young viewers that CBS almost didn’t repeat this episode, and only did so as the very last of the First Season reruns. Below: Will wishes up something hot to eat for Dr. Smith … alien-style. The line was in the script. But that didn’t mean Roley remembered wrong about suggesting Harris say it. By this point, Harris had the ear of Tony Wilson and was making suggestions of his own for changes in the scripts. The cast members would be given a copy of the Shooting Final teleplay days before filming started. Then, as the production progressed, additional sets of page revisions would come down to the stage from Tony Wilson’s office. In the case of this script, there were page revisions on October 27 and 29, and November 2. Many of these were a result of ideas from Harris which Wilson, and Irwin Allen, approved and had inserted into the shooting script. Something Roley can indisputably be given credit for, in collaboration with cinematographer Gene Polito, is the wonderful use of the camera. Roley and Polito reach a zenith in this episode with hand-held/wide angle camerawork and zooms. In particular, when Smith wishes for a new Jupiter II, the camera angle makes it almost look as though a full-size ship appears in the foreground, until the point of view angle cranes up and we realize it’s a small ship. This was the actual fifteen-inch special effects filming miniature. 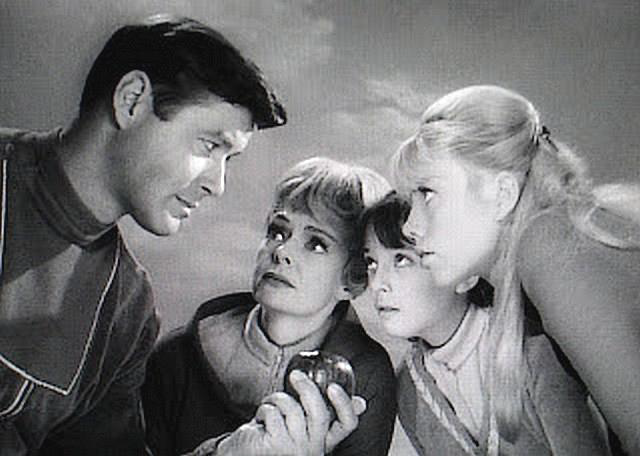 Later on this night, at 7:30 p.m. (6:30 Central), the whimsical “My Friend, Mr. Nobody” – the seventh broadcast episode of Lost in Space – had its only CBS airing. Day 2: Thursday, October 28. Again, the entire cast was present on set at 8 a.m. as they continued to work on Stage 11 at the campsite outside the Jupiter 2. After rehearsing, and adjusting the lamps, the camera began rolling at 9:25 a.m., with the final shot of the day taken at 7:10 p.m. The production was still on schedule. The last shot was completed at 6:30 p.m. Sutton Roley had fallen to one-quarter of a day behind schedule..
Day 4: Monday, November 1. Work resumed on Stage 11 for more of the sequences staged on the upper deck of the Jupiter 2. Following this, there was a company move to Stage 6 to film on the “Ext. Bushy Area” set, as well as “Ext. Rocky Area” and “Ext./Int. Ghost Spaceship.” Dawson Palmer continued to perform with Williams, Goddard, Mumy, and Harris. Not needed this day: Lockhart, Kristen, May, and Cartwright, although the latter was on the lot attending school. The cast and all else involved in the making of Lost in Space received good news on the set. CBS had increased its episode order beyond sixteen, renewing the series for the balance of the 1965-66 TV season. Day 6: Wednesday, November 3. Only Williams, Goddard, Mumy and Harris were required, as they continued to work on Stage 6, with “Ext. & Int. Ghost Ship” (both “clean” and with “cobwebs”), and then a company move to Stage 5 for sequences in the lower deck of the Jupiter 2. The last shot was completed at 6:30 p.m., but the crew was kept until 8:30, preparing the set for the next day’s work. “Wish Upon a Star” was supposed to finish but was now a full day behind. The crew, working late, would miss Lost in Space this night, as “Invaders from the Fifth Dimension,” the eighth episode to air on CBS, had its first broadcast. It was the only episode aired up to this point that would later be given a repeat telecast by the network. 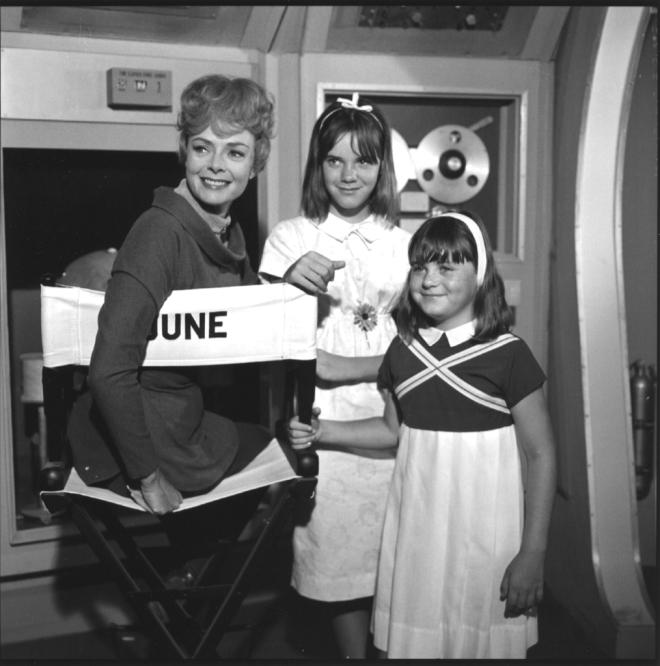 June Lockhart visits with two special guests to the set – her daughters: Anne and June Elizabeth. Day 7: Thursday, November 4. Director Sobey Martin was scheduled to begin work on “The Raft,” but told the night before that he was being pushed back a full day. Sutton Roley, meanwhile, went into a seventh day of filming with the sequences needed on Stage 6 and the “ghost ship,” then returning to Stage 5 for pickup shots on the upper deck of the Jupiter 2. He worked until 7:30 p.m., when the episode was finally wrapped. 20th Century-Fox Head of Television William Self approved a budget of $130,980 for this episode. The final cost, however, climbed to $149,655. The score was made up of tracked music, and again demonstrates the talent of supervising music editor Leonard A. Engel and music editor Joseph Rudy. Note how pieces of music from other episodes are perfectly matched with newer footage here. To name only three: John Williams’ “floating music” from the sequences in “The Reluctant Stowaway” when the children and Dr. Smith experienced weightlessness, now used as Dr. Smith glides around the area where he plans to wish into existence a replica of the Jupiter 2; Herman Stein’s cowboy brawl music, which accompanied the fight between Jimmy Hapgood and Don West in “Welcome Stranger,” used here when Will and Penny wrestle for possession of the wish machine; and Stein’s hauntingly lovely melody first heard in “There Were Giants in the Earth,” was now utilized during the scenes when John has heart-to-heart talks with his family. When “Wish Upon a Star” first aired on CBS, it was the night before Thanksgiving. Most Americans had the next day off. On the radio, the Supremes had the most popular song with “I Hear a Symphony.” In the stores, the soundtrack album from The Sound of Music, with Angela Cartwright among those singing, was the best-selling LP in the nation. In the movie houses, King Rat, starring George Segal, was still top film. On the New York Times Best Sellers List, Ian Fleming’s The Man with the Golden Gun was in the Top Ten. On the cover of TV Guide, Efrem Zimbalist, Jr. of The F.B.I. Inside was a two-page article on Marta Kristen entitled “Norwegian Cinderella.” She was described as “a slim, wide-eyed, flaxen-haired girl who looks like a combination of Mia Farrow and Tuesday Weld." Dawson Palmer and Jonathan Harris pose for a promotional photo. 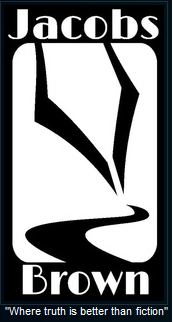 However, CBS preferred to distribute the one at the top of the chapter; it contained no stone-faced monster. Kristen talked about how she had been born Birgit Annalisa Rusanen in Norway during the final days of World War II, the daughter of a German soldier whom she would never meet, then placed in a Norwegian orphanage before being adopted by a Detroit couple and brought to America at the age of four. She told how she was taught to speak English and then had “the good luck to be an adaptable extrovert.” A career in show business followed with all roads leading to Lost in Space. 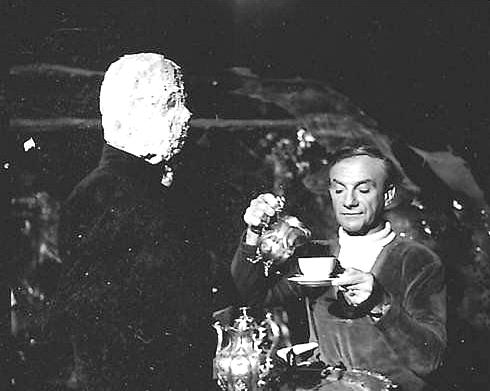 There’s only one thing wrong with Jonathan Harris’s performance as the evil Dr. Zachary Smith on the CBS-TV Lost in Space series. He’s so charming, you refuse to accept him as a villain. In real life, he isn’t even close to the wonderful characterization of Mr. Philips he contributed in the late, lamented Bill Dana Show. His energy and effectiveness are almost beyond belief. He is a quicksilver conversationalist and one just doesn’t interrupt. This fantasy series comes up with inventive gimmicks to whet the appetites of youngsters. In this one, there’s a new creature called Rubberoid, and a magic machine that can grant wishes. The only time the machine creates trouble is when greedy, villainous Dr. Smith asks for too many wishes. Sometimes wishes do come true. 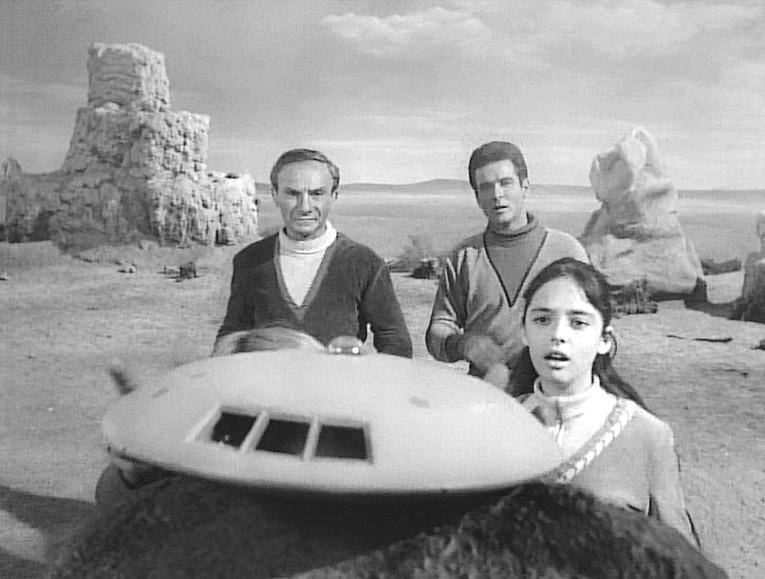 Among the top third of all prime time programs, Lost in Space was assured a mid-season pickup. Just one of 30 reasons why you should own a copy of Irwin Allen's Lost in Space: The Authorized Biography of a Classic Sci-Fi Series, Volume One by Marc Cushman -- read a sample chapter for just one of the First Season episodes. Then watch the episode again. And then imagine doing that 29 more times (including pilot film).